Alejandro Tonatiuh Hernández studied modern violin at the Nacional Conservatory (México city), historical violins at the Escola Superior de Música de Catalunya (Barcelona) and musicology at the Universidad Autónoma de Barcelona. 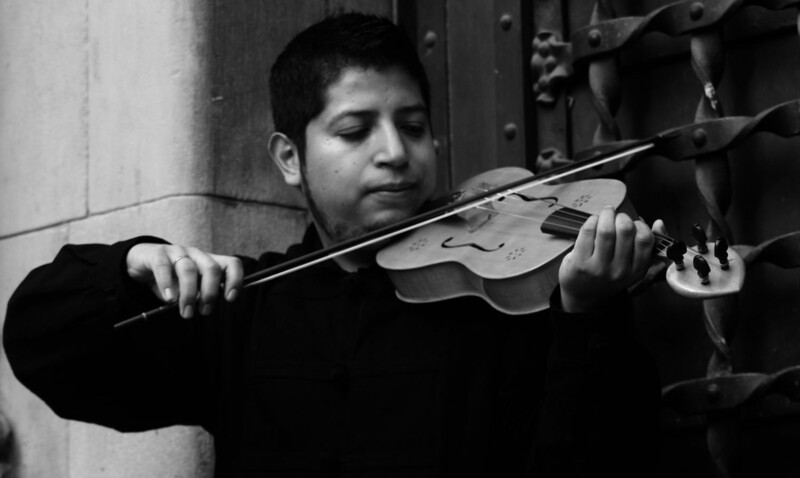 He has participated in courses of early music theory and performance whit Javier Hinojosa at the CNM (Conservatorio Nacional de México), seminars on ars nova and ars subtilior directed by Ana Margules at the ENM-UNAM (Escuela Nacional de Música), and Pedro Memelsdorff at the ESMUC and has studied 12th- and 13th-century performance practice with Mauricio Molina in the Conservatory of Girona. His interest in medieval repertoires and bowed string instruments from this period prompted him to form and direct in Mexico the medieval music ensemble Musica Enquiriadis, and to cooperate with the groups Sendebar and Magister Petrus (USA-Spain). Alejandro has also developed solo programs recreating the practice of the minstrels who sang and accompanied themselves at the same time with the vielle. This is in response to his interest in the reconstruction of the medieval song repertoire as recorded in many historical sources. For this type of reconstruction he received an early music award in 2001 from the Conservatory of Mexico. He uses to perform the medieval fiddle with different groups from Catalonia such Ensemble flor de Lis, Razos de Trobar or Mirall de Trobar. In collaboration with Florian Joungneau, instrument maker specialized in the reconstruction of medieval instruments, presented a lecture-concert focused on the medieval fiddle at the Journées de musiques anciennes 2013, Vanves, Paris. He participated in the festival Trobarea dedicated to the Troubadour repertory organized by the ensamble Flor enversa, Vence august 2015. Alejandro Tonatiuh is on the regular faculty of string bowed instruments at the International Course on Medieval Music Performance (12th-14th centuries) in Besalú. Alejandro Tonatiuh Hernández, Blog at WordPress.com.